THORPEX is a long-term research program organized under the World Meteorological Organization's World Weather Research Program. THORPEX research seeks to accelerate improvements in the accuracy of high-impact,1-14 day weather forecasts for the benefit of society, economy and environmental stewardship. THORPEX seeks to reduce and mitigate the effects of natural disasters on society by transforming timely and accurate weather forecasts into specific and definite information in support of decisions that produce the desired benefits. 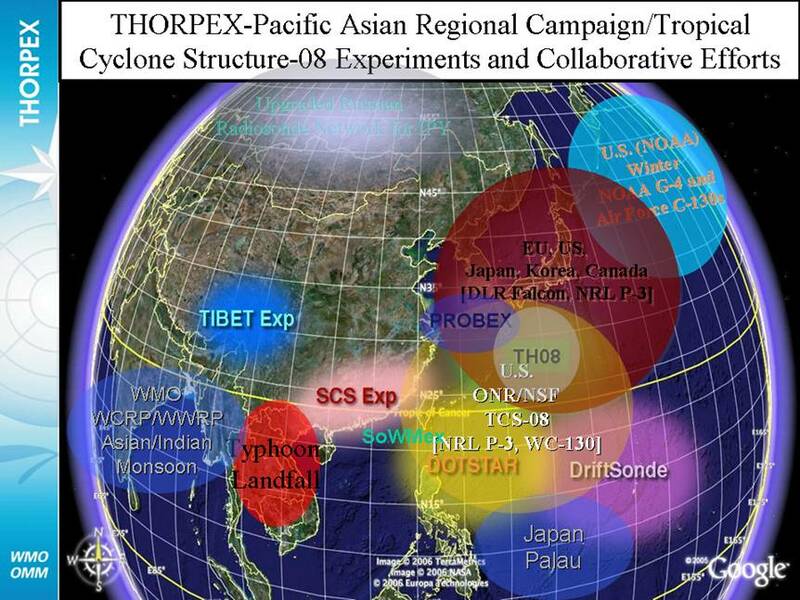 The THORPEX Pacific Asian Regional Campaign (T-PARC) is a multi-national field campaign planned by the Asian and North American Regional Committees and their associated national science committees that address the shorter-range dynamics and forecast skill of one region (Eastern Asian and the western North Pacific) and its impact on the medium-range dynamics and forecast skill of downstream regions (eastern North Pacific, North America and perhaps stretching to Europe). The field phase of T-PARC is designed to leverage multi-national efforts to address these two overarching foci. While T-PARC encompasses varying time and space scales, the primary objectives of each region are the same (i.e., to increase understanding of the mechanisms that will lead to improved predictive skill of high impact weather events) . This multi-scale approach is desirable as these two regions have strong dynamical links. For example, high-impact weather events over the western North Pacific and East Asia, such as persistent deep tropical convection and intense cyclogenesis, can trigger downstream responses over the eastern North Pacific and North America via upper-tropospheric wave packets on the primary Asian wave guides. These wave packets can, in turn, be invigorated by subsequent cyclogenesis events, which make the impacts farther downstream fast-spreading, far-reaching, and associated with reduced predictability. The high-impact weather events over North American driven by these processes include intense extratropical cyclones, orographic precipitation, flooding, severe weather and the hot, dry winds that increase the risk of wild fires and the severity of droughts. The primary observation period of T-PARC contains nationally-funded programs with objectives that can be categorized as targeted Data to improve the initial conditions for numerical prediction of tropical cyclone tracks, tropical cyclone formation, intensification, and structure change, and the extratropical transition of a tropical cyclone and downstream impacts.